NOTE: M50/PGU series ammunition is normally packed in the M548 container, as loose rounds (not prebelted). The Linkless Ammunition Loading System (LALS) eliminated the requirement for prebelted ammunition. The rounds are packed in the container in layers. There are cardboard partitions between each layer and between the rounds on all sides of the container. Each round has a tubular-shaped cardboard protector around the projectile. Use these cardboard partitions and tubular protectors when repackaging the ammunition in the containers. LINKLESS AMMUNITION LOADING SYSTEM (MHU SERIES) LEARNING OBJECTIVE: Identify the com- ponents of the linkless ammunition loading system to include loader ammunition transporter, drum loader and drum unload assemblies, and the conveyor system. Identify the operating procedures to follow when loading/downloading the transporter and aircraft gun system. The Linkless Ammunition Loading System (LALS) (fig. 7-12) consists of a loader ammunition transporter MHU-131/E32K, a drum loader assembly MHU-133/E32K, a conveyor system MHU-130/E32K, and a drum unload assembly MHU-132/E32K. The components of the LALS allow 1,400 rounds of electrically primed, M50/PGU-series ammunition to be handled without the use of links while the ammunition is still RADHAZ safe. The system is used to transport ammunition, load and download aircraft, and load and download the loader ammunition transporter. COMPONENTS A brief description of the components in the Linkless Ammunition Loading System (LALS) is contained in the following paragraphs. Loader Ammunition Transporter MHU-131/E32K Unfired rounds and/or empty cases are stored in the loader ammunition transporter, also known as the transporter (fig. 7-13). The transporter is primarily intended to move rounds/cases through the exit and entrance ends during operation. Except for size, the transporter is similar to the aircraft drum assembly. The transporter can be locked onto the MHU-191/M transporter or stacked three high for storage purposes. 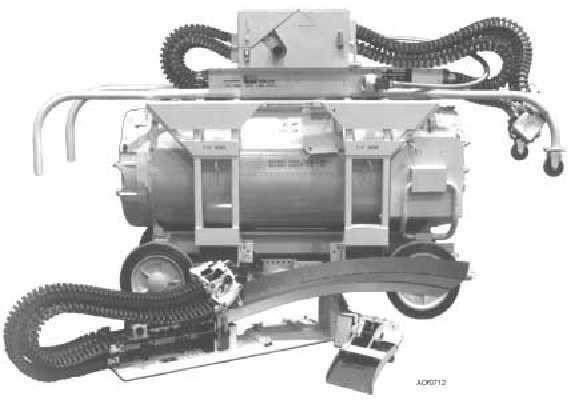 The transporter has an ammunition drum mounted in a rigid-frame drum adapter assembly. 7-10 Figure 7-12.Linkless ammunition loading system (LALS).